Personnel from the Combined Maritime Forces (CMF) met with representatives from the United Nations Somalia and Eritrean Monitoring Group (UNSEMG) to gain a better understanding of each organisations effort within the Somali region. The visit by the UNSEMG to CMF was the first of its kind, and involved a two-day workshop where personnel from CMF headquarters and staff from Combined Task Force (CTF) 150 and 151 met with Dr Jarat Chopra, Mr Jorg Roofthoot and Mr Dinesh Mahtani, UNSEMG representatives. 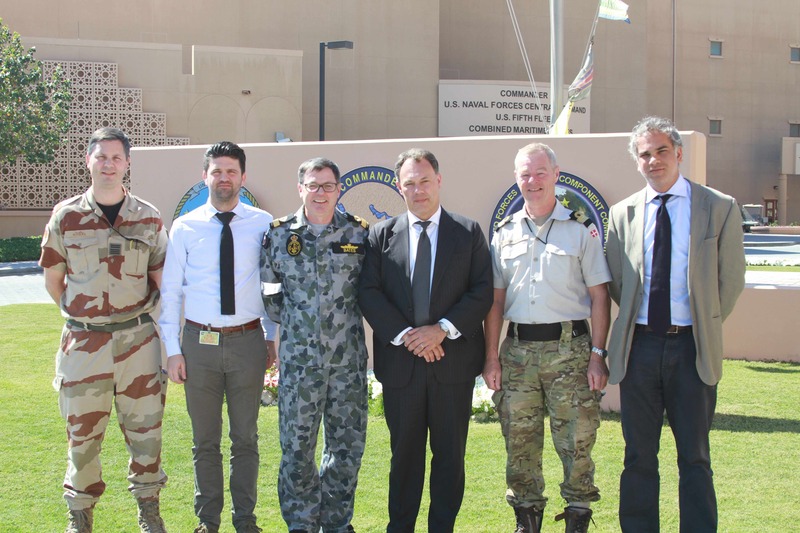 From left: Captain Jacques Riviere, French Navy, Director Plans CMF, Mr Jorg Roofthoot, Commodore Daryl Bates Royal Australian Navy, Dr Jarat Chopra, Commodore Aage Buur Jensen Royal Danish Navy, and Mr Dinesh Mahtani. After receiving detailed briefs about each other’s roles and functions, much of the discussion was focused on the issue of illegal smuggling of charcoal from Somalia, in contravention of UN Security Council Resolutions, and how CMF and the UN could work together to combat this complex problem. CMF is a 30-nation maritime partnership working to defeat terrorism, prevent piracy, reduce illegal trafficking of people and drugs, and promote the maritime environment as a safe place for mariners with legitimate business. CTF 150’s role is to maintain maritime security and conduct operations to disrupt and deter terrorism and terrorism-related activities in the maritime regions of the Middle East and Indian Ocean. CTF 151’s mission is to disrupt piracy and armed robbery at sea and to engage with regional and other partners to build capacity and improve relevant capabilities in order to protect global maritime commerce and secure freedom of navigation.